Cyprus is the eastern island in the Mediterranean. Because of this location, through the centuries, it was a bridge between the cultures of Europe and East. During 4000 b.d, the first immigrants coming from Minor Asia, immigrated to Cyprus, and brought to the island the rural civilization. The remains of Chirokitia village are classified in this period. The village people were using jugs made of stone and living in houses with mud walls. Afterwards they started using ceramic plates made of argilio. A lot of the foundings of that period were decorated with beautiful painted designs. During the 13th century-from this century, the period of copper begins-Cyprus trade was rapidly expanded into many countries. 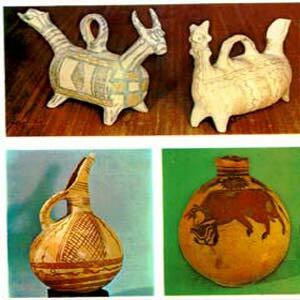 Also at that time Cyprus was a spiritual center after it came across with different Aegean civilizations. At that time the village Engomi was the most important center of sea-trade, and was controlled by the Achaean Greeks. Concerning the arts, Cyprus was completely independent from Greece; it was more influenced by the East countries. There are no remains from public buildings, except from the Kingdom in Bouni(5th century b.d), which is far away from the Greek architecture standards. Common characteristics of all the ancient temples is the big inner yard surrounded with other smaller yards and small rooms. Sculpture came up for first time at the 7th century b.d. At the beginning somebody can observe Assyrian influence and then Egyptian. Afterwards the influence of the Greek art is obvious, where the subjects were taken from real life incidents. The pictures below show beautiful historic foundings, from different periods in Cyprus history. 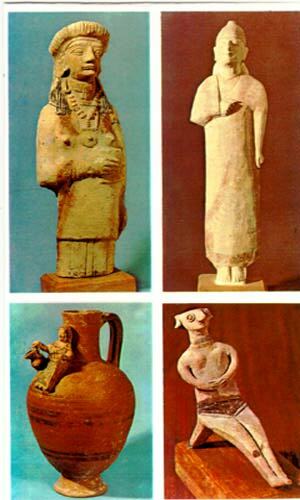 All of them can be found in Nicosia Archaeological Museum. The Awards for Excellence in Letters and Arts constitute an institution established in 1993 on the initiative of the Ministry of Education and Culture, with the aim of morally rewarding, recognizing and acknowledging the intellectual and artistic activity of Cypriot creators. It is the gift in return, the expression of gratitude to those who have toiled and continue to toil for the cultivation of letters and arts. Holders of the Awards for Excellence constitute the most respected body of Cypriot creators. The aim of the Ministry of Education and Culture is that all the leading creators, all those who have devoted themselves to the service of culture, who have reached the top of the ladder of intellectual creation, should gradually be honored and admitted to this body. President Clerides made the presentation at a brief and simple ceremony at Casteliotissa Hall on January 5th, 1995. "The duty of paying honour has brought us here today," he said. "The state is awarding fitting commendation and is rewarding with the highest state distinction: Excellence in Letters and the Arts, three leading creators: Costas Montis, George Philippou Pierides and Costas Ioannides. It is rewarding their contribution of many years, their intellectual presence and their contribution to the cultural "arming" of this country which, over the above political scheming, also faces threats and dangers directed against its national identity and its cultural heritage. With their intellectual creation they convey the message that Cypriot Hellenism will continue to create and to serve the beautiful and the good." In her address, Minister or Education and Culture Claire Angelidou outlined the personality and work of the three guests of honour. Costas Montis is not simply a great Cypriot poet. He is the leading, living Greek poet. The award to him coincides with the completion of 60 years in the field of literature. His verse crossed the boundaries of Cyprus early on and achieved panhellenic recognition. The publication of the collection of poems "Moments" in 1958 was a landmark and milestone for Greek literature. His personal writing, his own path to poetry, allusive, gnomic and immediate verse, his elliptic style, bold phrasing, his sharp expression of sarcasm, what has been called the "instantaneous type of poetry", this direct, striking, spiritual communication with the reader, placed him at once in the vanguard and brought him universal recognition. "Moments", "Letter to Mother", "From Beloved Cyprus", "Grieving", "Cyprus in Aulis", "In the language I first spoke", Cypriot Idols", "To Slaughter", "In Fear of Men". "Fighting Against"., "In Conclusion" are some indicative titles of the collections of Costas Montis' poems which show the breadth and the greatness of his poetic conception. And as well as his "immediate" poetry there is his admirable prose work, his short stories, his novelettes and his important novel "Master Batistas and the others". And there is also his work in the theater, and in compiling anthologies. All these constitute the immense intellectual deposition of Costas Montis. Ceorge Philippou Pierides is the counter part in the field of prose. An intellectual creator who marked with his ethos and his work the development of Cypriot prose. Cairo, Famagusta and Nicosia mark his course, his style and his contribution. An active member of the intellectual life of Egyptian Helenism, he brought his cultural activity to his birthplace in 1947. Egypt and Cyprus, the world, its peoples their pain and sweat co-exist and are expressed together in a universal setting, which defines his narrative work. Exactly fifty years ago "Cotton Merchants " was published, which was the start of his literary work. There followed the collections of short stories "From the Middle-East", "Hard Times", "Calm Times". The "Time of Prosperity" and "The Time of Trial", which together make up the "Tetralogy of Times", remarkable for its inspiration and style. His rich narrative and prose work continued with "Memories and stories from Egypt" and was completed with the book "The good citizen and the others". To this must be added his significallt work as an essayist and his studies, which show the breadth of his intellectual abilities and the dimensions of his education and inspiration. Costas Ioannides works tirelessly and quietly in the service of music and musicology. He has written many papers on the Music and folklore of Cyprus, for which he was honored in 1962 by the Academy of Athens. With full studies in musicology and a special intuition, valuable equipment for the path he chosed, he was engaged in composing but mainly in the study of Byzantine and more recent traditional music. For years he has been the prime worker and the mainstay of the effort to collect and preserve our musicai heritage. The Cultural Services of the Ministry of Education and Culture in collaboration with the Municipality of Morphou and the Communal Movement of Zhodia organized a festivity in memory of Loukis Akritas. The festivity held at Casteliotissa Hall on 29th March marked thirty years since the death of this prominent personality. The festivity was opened by the address of the Minister of Education and Culture, Mrs. Claire Angelidou. She referred to the life and character of this national visioner, whose ideals had their roots in Cyprus and who fought for the national revival of Greece. "In keeping alive the memory of personalities like L. Akritas", she added, "we confirm our ability to act in the present and to advance towards the future". Addresses were also made by the Mayor of Morphou, Mr. Andis Pantelides and the President of the Communal Movement of Zhodia, Mr. Costas Hadjiyiannis. The main speaker of the day was Mr. Anastasis Peponis, the Greek Minister of Justice. Referring to L. Akritas' many - faceted personality, Mr. Peponis said that "it is not possible to define Loukis Akritas, to assign him to categories of thought and action in just a single word. He was the journalist. He was the Cypriot freedom fighter. He was the writer. He was the unswerving democratic politician in the Greek world. He was the representative of inspired speech. He was the minister of political action. Dominated by a relentless passion for struggle and creation, he had enriched this passion with the sensitivity of the intellectual, armed it with the deep knowledge of the history of Hellenism and its cultural heritage, carved it from his schooldays with the daily toil that marked his life right to the very end. The pedestal of his ideological orientation was always democracy." At the end of the ceremony, philologist Themis Masouras presented "Dekatria Kimena"(Thirteen Texts) by Loukis Akritas. The book was published by the Cultural Services of the Ministry of Education and Culture to mark 30 years since Loukis Akritas' death. Mr. Masouras selected the thirteen essays and wrote the introduction to the book and Mr. Pavlos Paraskevas, Cultural Officer A, was in charge of the publication. Loukis Akritas was born in the small town of Morphou in 1908, in a farming family and was baptized as Loukas Hadjiyiannakou. 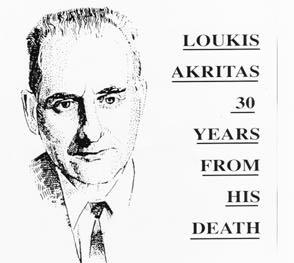 In 1932 he assumed the pen name of Loukis Akritas under which he carried on his life-long political, journalistic and literary career. He attended the elementary school in his native town and the Pancyprian Gymnasium in Nicosia which he graduated in 1925 carrying off all the school prizes of that year. He proceeded with his studies at the Teachers' Training College and in 1926, at the age of 18, he was appointed primary school teacher in Morphou. He taught in primary schools for four years only. During that period he acted as a reporter for the newspaper "Xrono" (TheTime) of Limassol. The year 1930 was a cornerstone in his life. With no financial means, but armed with "good references" he moved to Athens. After two years of unemployment and deprivations he succeeded in getting into journalism working as an editor for "Proina" (The Morning) and "Estia" (The Hearth). During the dictatorship imposed by Ioannis Metaxas in 1936 he was dismissed and persecuted for his political conceptions. When the war with Italy broke out (1940-41) he served as a private in the army, and sent reports to "Estia" (The Hearth) as a war correspondent. He also published in the illegal press and was actively involved in the negotiations aiming at constraining the occupying German forces to surrender the city of Athens to the Greeks. Until the return of the Greek government from exile (in Cairo) he served as a Press Secretary. After the war, in 1941 he achieved one of his dreams: to publish his own newspaper "Kathimerina Nea" (Daily News) which came out until 1945. His articles encouraged the Greek people to keep a stiff upper lip during the German occupation ordeal. He also fought with all his energy hoping that the civil war might be averted. In 1949 he started issuing the review "Ellinika Xronika" (the Greek Times) with outstanding collaborators such as Angelos Sikelianos, G. Theotokas, Tatakis, J.M. Panayiotopoulos and others, but the competition of the commercial press of the time forced him to close it after a few weeks only. In 1959 he ventured once again with the publication of "Kosmos-Epistime ke zoe" (the World-Science and Life), a highly appreciated cultural journal. In spite of the support offered by Nikiforos Vrettakos, it ran into financial difficulties and had to be closed down in 1961. This was Akrita's last attempt at publishing his own paper. In 1950 Loukis Akritas appears on the political scene as the General Secretary of the National Progressive Union of the Centre (EPEK), founded by Nicolaos Plastiras. In 1951 he was first elected to Parliament. In his capacity as EPEK deputy he visited Cyprus in 1952 and attempted to set up a new "Filiki Eteria" (Society of Friends) with a view to liberating Cyprus from British rule. The attempt was foiled by the fall of the Plastiras government. As a member of the Ethnarchy of Cyprus he maintained a leadership role in the Cyprus issue and he was the first to raise the question of self-determination for Cyprus at the United Nations Organization. In 1963 and 1964 he was reelected as MP for the mainland Greek political party "Enosi Kentrou" (Union of the Centre) and was appointed Under-Secretary of the State for Education working directly under Prime Minister, George Papandreou who was officially the Minister of Education. In this capacity he prepared the proposals for the Educational Reform which went to the Greek Parliament in August 1964. His colleagues at the Ministry of Education described Loukis Akritas as the person who, with the modesty of the builder and the grandeur of one of the Great Teachers of the Greek ethnos, laid the foundations for educational reform. His work was abruptly interrupted by his sudden death in 1965, but he left his impact on the subsequent developments. 1941 - " Oneiro Agapis" (Love Dream), theatrical play. 1995 - "Dekatria Kimena" (Thirteen Texts), essays. 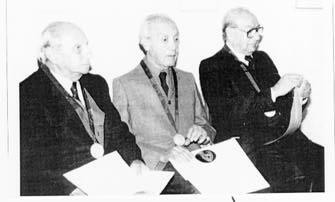 On 15 December 1994, the Minister of Culture of the Republic of Egypt Mr. Farouk Hosni, accompanied by high-ranking government officials and in the presence of foreign diplomats and a large crowd of art lovers, artists and critics inaugurated the Fifth International Cairo Biennale of Art which was held at the National Museum of Modern Art, the Zamalek Centre of Arts and the College of Applied Arts. Cyprus was represented by three artists: Glyn Hughes, Andreas Makariou and Theodora Pyliotou. Glyn Hughes, the Welsh born artist, has made Cyprus his home since 1956. With his work as a painter who has been incessantly attached to his vocation, persistent, restless and innovative and his art criticism through the press, he has contributed extensively to the development of Contemporary Cyprus Art. Andreas Makariou has made his appearance on the Cyprus scene around 1980. Since then he has produced a prolific amount of work of continuously changing concept and technique. Theodora Pyliotou is a very talented young painter who belongs to the youngest and most volatile generation searching constantly and consistently for self identity. Cyprus exhibited at the Zamale Centre of Arts. A dominant Andy Hadjiadamos wooden female sculpture gave a first taste, of what was to be seen in the main hall where Cyprus had its very impressive show, with Glyn Hughes exhibiting four large paintings and Andreas Makariou four large drawings representing Cyprus in the corresponding sections of painting and drawing. In the same area Elena Kalotari's three paintings were shown, and a second wooden piece of sculpture by Andys Hadjiadamos. 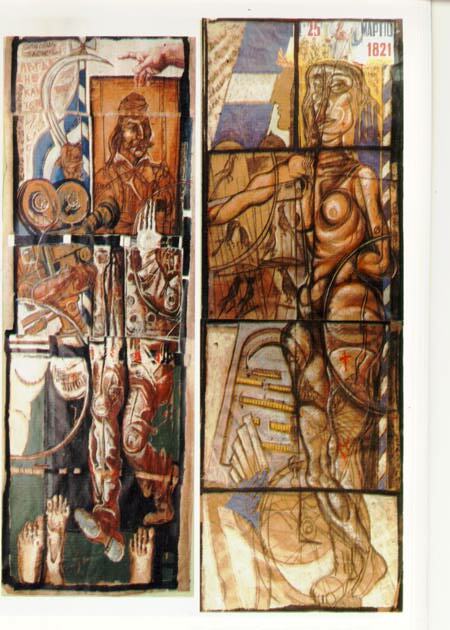 Theodora Pylioti's four paintings were exhibited separately at the College of Applied Arts where the works of the Young Artists category were grouped together. The nine-member Jury Committee was headed by Professor Dr. Mostafa El Razaz, Dean of the Dokki College of Art Education, Cairo. The Nile Grand Prize was awarded to Egyptian sculptor Farouk Wahba and five Biennale Prizes went to Morocco for painting, Egypt for sculpture and drawing, Spain for graphics and Croatia for installation. A delegation from Cyprus which attended the inauguration and festivities of the Biennale was headed by Senior Cultural Officer, Nicos Panayiotou, and included Valentinos Charalambous, Commissioner for Cyprus, and artists Glyn Hughes and Theodora Pyliotou. For private reasons, Andreas Makariou could not join the delegation. Andreas Makariou: from the series "Ecce Homo", mixed media. A group of ten promising creators represented Cyprus at the Young Artists Biennial from Mediterranean European Countries which took place in the capital of Portugal from 15 November, 1994. Dr. Eleni Nikita, Cultural officer A at the Ministry of Education and Culture, was the commissioner. This year Cyprus was represented in the field of Fine Art by Elena Kalotari and Maria Papacharalambous. E. Kalotari presented the developing course of the illusion and truth of our existence in relation to the concepts of the circle and the triangle, coming to the conclusion that "Man tends to move away from repetitive movement in order to reach the divine." M. Papacharalambous paints from a need to unload her feelings. Memories, representations, experiences, roots from other times and places rise up to the surface from the depths of the subconscious . Achilleas Kentonis' photography pursues each forgotten "beam of light", he strengthens it with his imagination and prints it on normal paper with the least possible conceptual approach. Costas Mantzalos presents another hnd of communication. As a graphic designer, he has to combine the functional with the aesthetic, conveying brief, optical messages. As he himself says, "The messages come from feelings. The feelings from sentiment. A circle of anger, joy, sorrow, eroticism and quest are translated onto paper by means of color, line and texture." In the field of design, Yenethlios Anastasiades very resourcefully conceives his own devices correlated to human communication which convey thoughts of friendly messages. The architect Sotos Lamnisos uses contemporary durable materials which cost nothing to maintain. He arranges the space within the house functionally, in accordance with the conception of the way of life of its future inhabitants. At the fashion show, which was held in Lisbon, the designs of Maria Paschalidou's multi-colored knitwear stood out. As she herself says, she based her designs on basketery and wood carving, believing in Miyake's theory that "an item of clothing takes life from the person wearing it." Clothes are complemented by jewellery. The jewellery of Skevi Afaniti is based on Cypriot folk art. Her simple, elegant jewellery is influenced by Leflkara embroidery. Maria Kotsoni, working in the same field, starts from a different point. Born in Paphos, influenced by Aphrodite, goddess of fertility, love and beauty, she creates jewellery which is brighter and more sumptuous, mixing various elements. The dance group "Rhoes" presented in Lisbon excerpts form the work "Hellenism - now and always" with music by Vassos Argyrides. The choreography of Zeleia Georgiadou, Margarita Andreou and Sophie Georgiadou shows the course of Hellenism. In an admirably successful way for a young poet, Zeleia Grigoriou masters her poetic material, loading allusions with a new view and sense of reality. In her poems there is the pleasant surprise of surrealism without, however, the poetess being confined to strict hyper-rationality. Maria Kotsoni "Swan with Lotus flower", Brooch. (Silver and blue topaz), 1994. 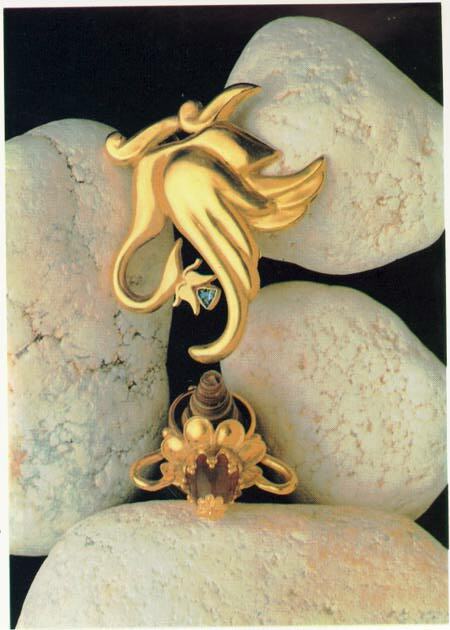 "Two Swans on a flower", Ring (Gold), 1993. Nicosia will host the European Cultural Month in Autumn 1995, from 15 September to 15 October. The event aims at bringing Europe and its contemporary culture closer to Cyprus and giving Europe the chance to get to know the culture, history and traditions of the, capital of this eastern Mediterranean island. The final programme of the European Cultural Month will cover all forms of art, poetry, dance, theatre, cinema, painting, music, etc. There will also be conferences and seminars and other presentations of cultural activities including exhibitions and publications . The idea of having a Cultural Month onginated in 1992, and is regulated by the Council of European Culture Ministers. It is founded on the principles of the Cultural Capital of Europe, an institution which was first conceived by the late Greek Minister of Culture, Melina Mercouri, in Athens, in 1985. The Cultural Capital is confined to cities of EU member-states, while the Cultural Month is restricted to cities of non-member countries. Any city wishing to host either event submits an application to the Council of European Culture Ministers, which then decides on the venue of both events. Nicosia filed its application to host the European Cultural Month in May 1992 through the Ministry of Foreign Affairs of the Republic of Cyprus. Nicosia Mayor Lellos Demetriades, went to Brussels to submit and support Nicosia's bid to host the Cultural Month. Support for Nicosia's proposal came from the then Greek Minister of Culture, Dora Bakoyianni, and the Greek delegation to the European Union's Committee. In November 1993, the European Ministers of Culture decided to accept Nicosia's application as organizer of the Cultural Month. The late Melina Mercouri, then Greek Minister of Culture, argued strongly in Nicosia's favor and succeeded in convincing her European colleagues that Nicosia should be given the chance to host the event . The initial decision, taken by the European Ministers of Culture, proposed that both Nicosia and Ljubljana, capital of Slovenia, should co-host the Cultural Month. But, Ljubljana later withdrew its bid, apparently because of local difficulties, and Nicosia now remains the sole host. In a parallel move, Luxembourg was named as European Cultural Capital for 1995, and will organize events accordingly. Once Nicosia was chosen, Nicosia Municipality assigned its Cultural Committee to see the job through. The Committee started work with help from the government, in particular the Ministry of Education and Culture, and from other organizations such as the Cyprus Tourism Organization and the Antiquities Department. The Minister of Education and Culture, Ms Claire Angelidou, has taken a personal interest in organizational matters relating to the European Cultural Month. Following consultation with the relevant Ministry departments, it was decided to incorporate in the programme of the Cultural Month events of the international annual art festival "The Cypria". The Ministry has also undertaken to organize a special cultural event with an international flavor to it, and this is expected to attract particular interest. Apart from "The Cypria", the final programme of the Cultural Month will feature a scenes of events organized especially for Cyprus by member states of the European Union. Nicosia Municipality will present an exhibition entitled "The Nicosia Walls" about the history of this magnificent construction, and it also intends to publish a luxury publication on Nicosia. It will organize the spectacular Opening Ceremony within the Walls and the Closing Ceremony which will be staged at the Municipal Theatre. Events within the framework of Nicosia Cultural Month. Arch. Makarios III Amphitheater, Nicosia.